One of Istanbul’s most exciting spots, the Spice Bazaar (Turkish: Mısır Çarşı) was built in the 1660’s as part of the Yeni Mosque complex. Closed : October 29th and the full duration of religious holidays. One of Istanbul’s most exciting spots, the Spice Bazaar, also called Egyptian Bazaar (Turkish: Mısır Çarşı), was built in the 1660’s as part of the Yeni Camii/ New Mosque complex, in order to support the upkeep of the mosque and its philanthropic institutions such as a school, a hospital and several baths. 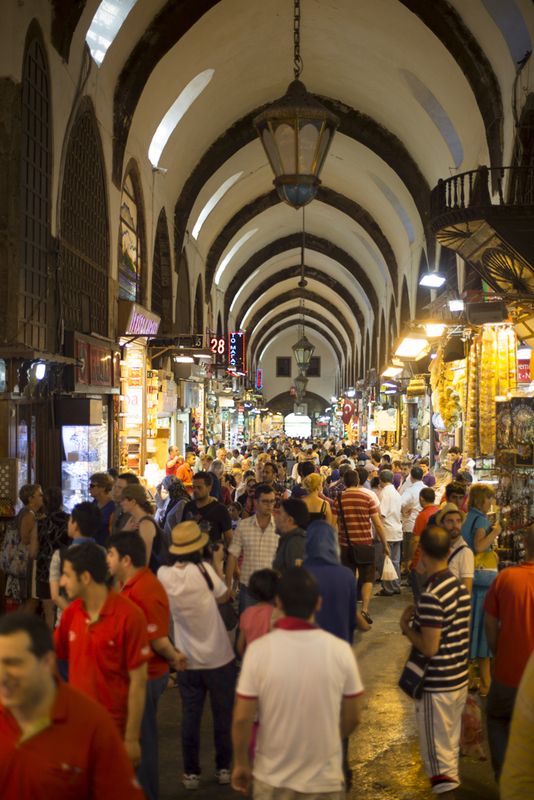 It is one of Istanbul’s oldest covered bazaars. 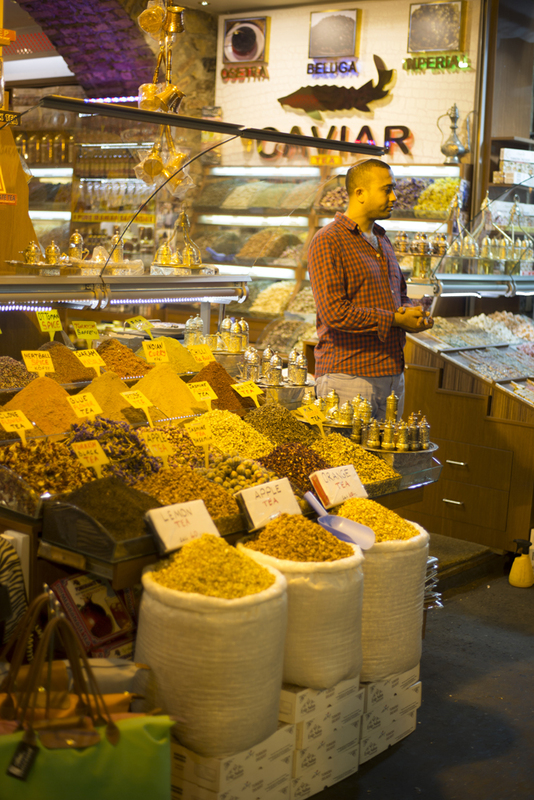 It takes its name ( Mısır çarşısı, the word “mısır” literally meaning “Egypt” as well as “corn” ) from the spices, medicinal plants and other products that were annually brought here with the so called “Cairo caravan” and were sold in its stalls. Designed in the shape of an “L,” it is composed of 88 chambered rooms. It has six entrances and the sections around the Haseki entrance are two-storied. During the Ottoman Period this upper story was used as a court to which shopkeepers and customers could bring their problems and complaints. 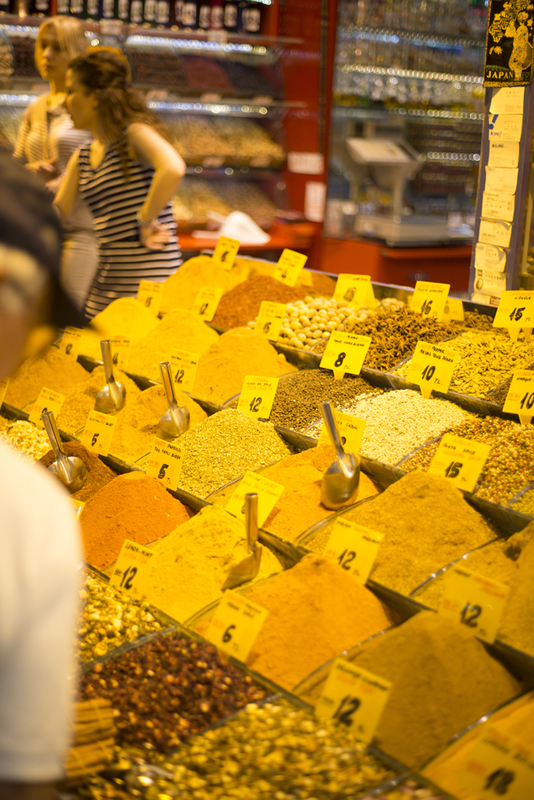 During Ottoman times the bazaar stocked spices and herbs in the market’s stalls; also old medicinal remedies were prepared here. Most of them prepared according to the recipes from the book, “Nüzhet-ül Fi Tercüme-Afiyet” (“A good appetite”). 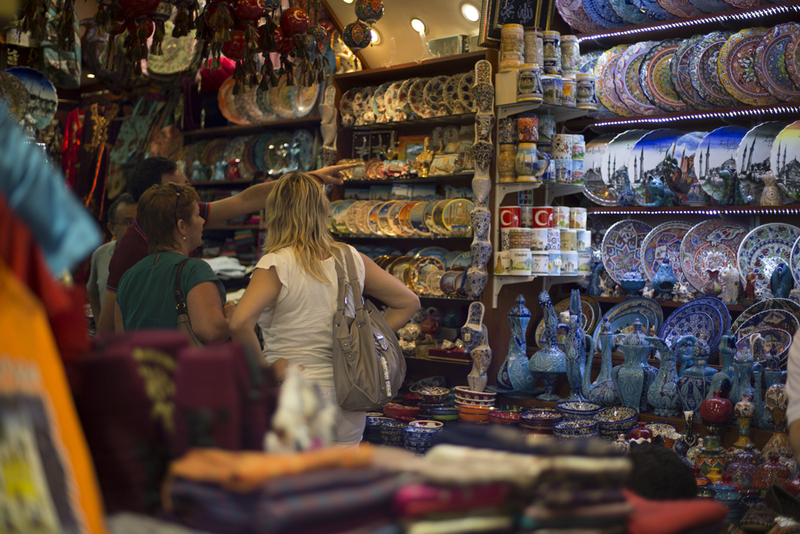 Today traditional products such as spices, herbal teas, dried nuts and fruits, and Turkish delight are found next to jewelry, fabrics, cooking utensils and various souvenir items. At the intersection of the the short and long branches of the bazaar an area is called the “Prayer Field” (Dua Meydanı) is located where an “Adhan ( Muslim call to prayer) Kiosk” is found. This section, designed and built out of wood, is the most notable part of the Bazaar. Once the bazaar opens, an officer in charge calls a prayer for the tradesmen and wishes them a high income. 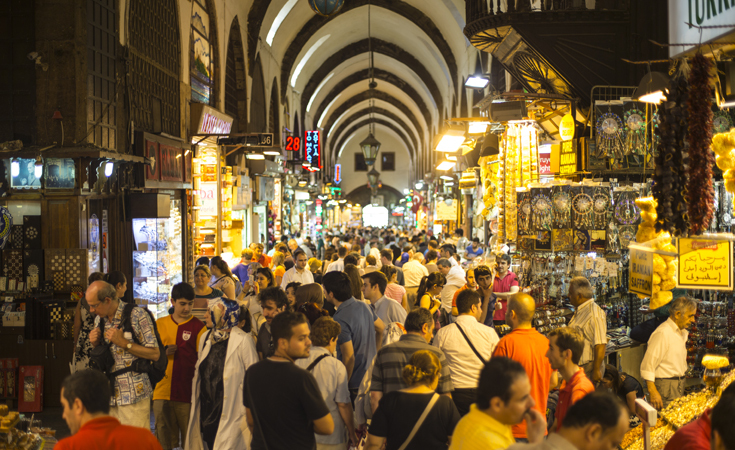 The Egyptian Bazaar suffered heavy losses during the two large fires in 1691 and 1940. It took its present shape in 1940 after being restored by the Municipality of Istanbul. Taksim: Take the funicular railway inside Metro station for Kabataş. From there catch the tramline T1 Zeytinburnu – Kabataş and get off at the Eminönü stop. Another way to get to the Spice Bazaar: Take the Nostalgic Tram Line for Tünel. 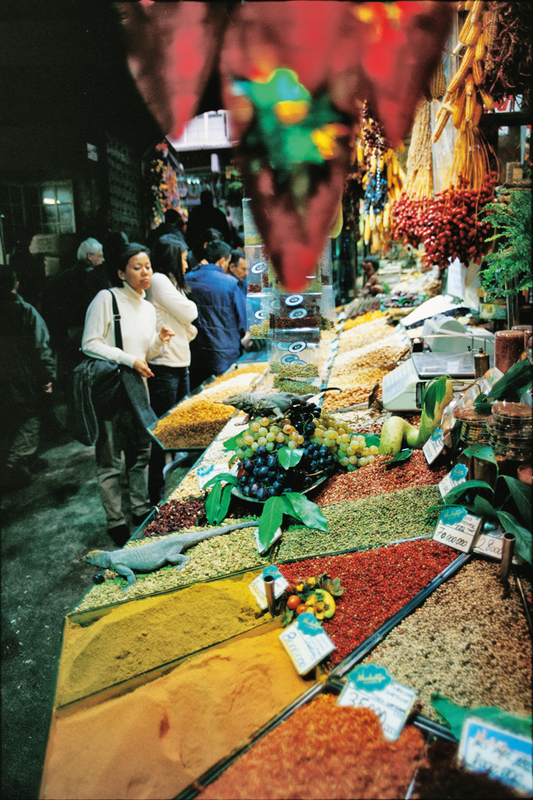 Through the historic tunnel get down to Karaköy and walk across the Galata Bridge to reach the Spice Bazaar. 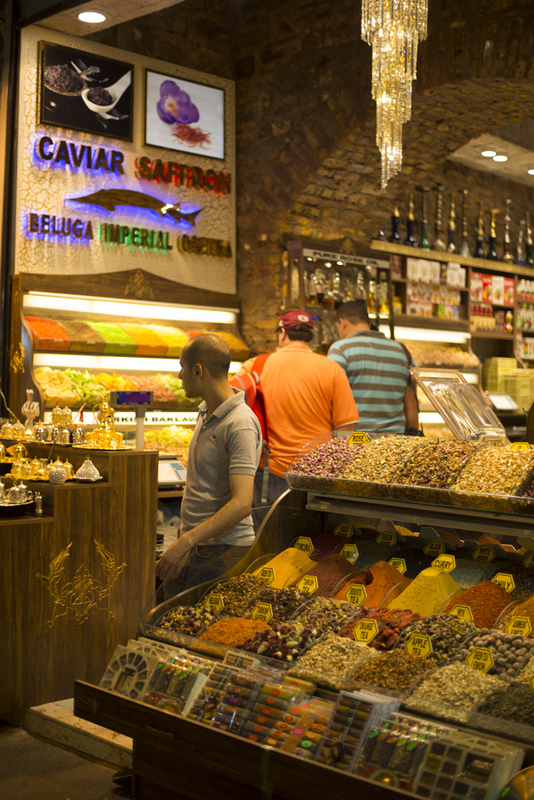 Atatürk Airport: Take the metro line M1 Aksaray – Havaalanı to reach the Spice Bazaar. Then get on the T1 Zeytinburnu – Kabataş tramline for Eminönü. Blue Mosque Area: Take the T1 Zeytinburnu – Kabataş tramline and get off at the Eminönü stop. The mosque, Yeni Camii, is located right near the Spice Bazaar.